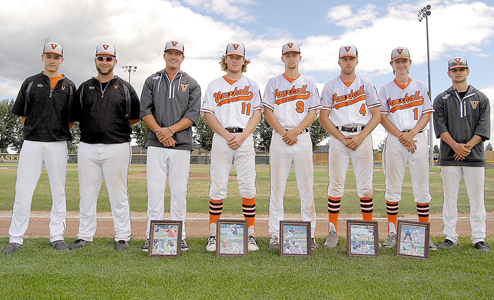 The Vauxhalll Spurs baseball club fell short in its quest to make the State tournament, despite going in as the number one seed for the north district tournament in Conrad, Montana which concluded this past weekend. The Spurs went 2-2 during the American Legion ‘A’ tournament, running out of gas in the end. The Spurs did show plenty of juice in its opening game, severely outmatching the Medicine Hat Knights, as the Spurs mercy ruled them 15-0. Unfortunately, it was that one big inning in which the opposition returned the favour that ultimately sunk the Spurs in its next game, a 9-8 loss in extra innings to the Tri-County Cardinals. The loss meant the Spurs had to play extra games, with hopes of a district championship coming through the back door. The team was able to win its next game against the Great Falls Electrics, 6-3. “They kept us in check for a little bit, where we won it in the end. But overall, we played well,” said Parsells. Finally playing on fumes, the Spurs’ district hopes were dashed with a 14-4 loss to the Lethbridge Miners — a team the Spurs had a 3-1 record against in regular season conference play. It was a tough-luck loss on an otherwise solid season that saw the Spurs finish first after regular season play that saw them go 24-4 in conference to go along with an up-and-down tournament record.